Dennis Gilbert has become the latest Buffalo native to play in an NHL game. Gilbert, a 22-year-old graduate of St. Joe’s, was recalled from Rockford by the Chicago Blackhawks and made his debut Wednesday night against the St. Louis Blues. Wearing No. 39, Gilbert played 12 minutes, 46 seconds on defense and had a two-minute minor penalty. The Blackhawks beat the Blues in a shootout, 4-3, on Jonathan Toews’ goal. The Blackhawks were eliminated from playoff contention on Tuesday and have two games remaining. 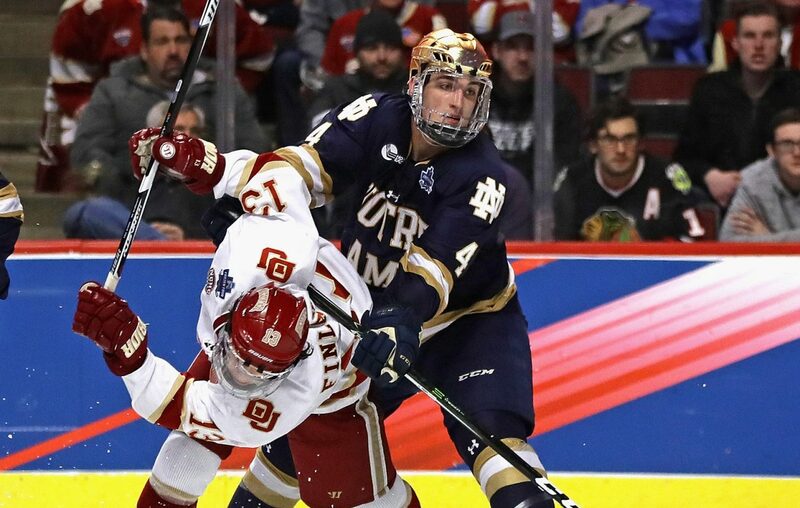 Gilbert signed a three-year entry-level contract with the Blackhawks last May after completing his junior season at Notre Dame, where he had four goals and 10 points in 39 games for the Fighting Irish, who lost in the NCAA title game. He was third-round draft pick in 2015. He finished his collegiate career with six goals and 42 points in 116 games. He was named Hockey East's Best Defensive Defenseman as a sophomore. As a high school player, Gilbert made a verbal commitment to Niagara while with St. Joe's. After leading the Marauders to a state championship in 2013, he opted to play juniors with the Buffalo Jr. Sabres. He then moved on to the USHL's Chicago Steel. More prominent hockey programs saw him and he gave up his scholarship offer and chose Notre Dame from among multiple options. "I had a goal, play in the NHL, and a dream, win a Stanley Cup, Olympic gold – all those things," Gilbert told The News last spring after signing. "Everyone thinks about it, but you have to have a process that you're focused on. I know the Bills coach talks about 'The Process,' and people joke about it a little bit, but you have to have a plan or your chance will pass you by." The last St. Joe's graduate believed to have appeared in an NHL game was Cole Schneider during the 2016-17 season with the Buffalo Sabres. Gilbert played two seasons at St. Joe's, earning Niagara Cup championship game MVP honors in 2013. He scored in the state final, a 3-0 win over St. Anthony's (L.I.). He also served as quarterback for the football team during his time at St. Joe's. "As much as we knew he was a special player, his work ethic and desire to compete really stood out," St. Joe's coach Rich Crozier said. "Our entire program is absolutely thrilled. ... To have a student-athlete work so hard toward a goal and to successfully achieve it ... we are so proud of him and happy for his family." With a surplus of healthy defensemen, the Buffalo Sabres assigned Will Borgen to Rochester following an optional practice Wednesday in KeyBank Center. Borgen, 22, was a healthy scratch Tuesday against Nashville and recorded a minus-5 rating in four games with the Sabres. He will rejoin the Amerks in time for their weekend home-and-home series against Syracuse, which begins Friday night in Blue Cross Arena. Rasmus Ristolainen returned to the Sabres' lineup Tuesday, while Matt Hunwick is back at practice and Matt Tennyson will be available as an extra defenseman Thursday against Ottawa.